GHRP-2, 0.1 ^g/kg sc administered to a 66-yr-old female 2x/d for 30 d.
Fig. 17. 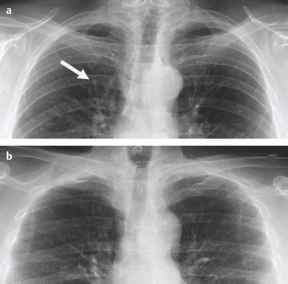 Effect of 0.1 ^g/kg GHRP-2 administered sc 2x/d for 30 d in a 66-yr-old female. Subject tested before treatment, at+15 d, and at +30 d after treatment. There was no change in the IGF-I levels. peptides. The GH response to 1 ^g/kg GHRP-2 is considered to impart more insight into the pathophysiology and more insight into the pituitary capacity to release GH. Without endogenous GHRH secretion GHRP-2 does not release GH and thus the GH release induced by GHRP-2 indicates the secretion of endogenous GHRH. Although still impaired in comparison to younger adults, 1 ^g/kg GHRP-2 releases considerably more GH than 1 ^g/kg GHRH in older normal adults and thus, this indicates more about the capacity of the pituitary to release GH. However, because 1+1 ^g/kg GHRP-2+GHRH or 10 ^g/kg sc GHRP-2 releases much larger amounts of GH than 1 ^g/kg GHRP-2 alone in normal young men, eventually one of these two approaches may be considered more optimal to assess the maximal capacity of the pituitary to release GH. aReproduced with permission from ref. 78. 6Mean ± SEM. cBody Mass Index. subjects are grouped according to whether the synergistic GH response of the combined peptides was absent, normal or high. In all three groups, the peak GH responses to GHRP-1 were nearly the same (18.7 ± 2.6, 13.6 ± 1.8, 24.8 ± 4.8), but for GHRH were different in the third group (2.5 ± 0.7, 3.9 ± 0.9, 13.6 ± 2.5). The results of the mean GH AUC paralleled the peak GH responses. Apparent is that the GH response to 1 Mg/kg GHRH was markedly impaired in the first two groups and in the second group, 1 Mg/kg GHRP-1 reversed the impaired GH response to 1 Mg/kg GHRH by synergistically releasing GH. It is assumed that synergism in the first group was not induced because of the limited capacity of the pituitary to release GH. From our later GHRP-2 studies, it could be postulated that if a lower 0.1 Mg/kg GHRP-1 dose had been administered in combination with the maximal 1 Mg/kg dose of GHRH, a synergistic release of GH would have been elicited in all three groups. What is seemingly so fundamentally important is that the action of GHRH on the pituitary is markedly impaired and this impairment can be uniquely reversed by administering low dose GHRP + high dose GHRH. Presumably the variable capacity of the pituitary to release GH will depend on the duration and severity of the putative GHRP-like hormone deficiency as well as the amount of endogenous GHRH and SRIF being secreted. The high sensitivity of the GHRP-2 effect on the reversal of the impaired GH releasing action of GHRH is against a primary decreased function of the somatotroph per se or a primary excess secretion or action of SRIF as the immediate cause of the pathological decreased GH secretion in older men and women. 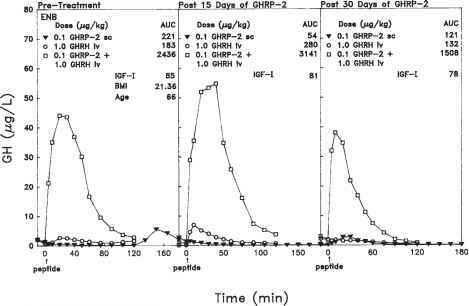 Envisioned is that when endogenous GHRH is secreted in greater amounts or SRIF is secreted in smaller amounts, 0.1 Mg/kg GHRP-2 will be more effective in enhancing the GHRH GH response and thus the effect of low dose GHRP-2 will be an indicator of endogenous GHRH secretion and also SRIF secretion. To what degree the pituitary capacity to release GH will parallel and determine the type and efficacy of the neuroendocrine therapeutic approach will require special evaluation. The secretory status of endogenous GHRH, SRIF, and the putative GHRP-like hormone as well as the pituitary somatotrophs, alone and collectively, probably will significantly dictate the type and design of neuroendocrine therapeutic approach. At present, if the quantitative GH release index is abnormally low, i.e., the GHRH peak GH response is <6 Mg/L to 1 Mg/kg iv bolus GHRH and the qualitative GH release index is threefold or greater, i.e., synergistic release of GH is induced by 0.1+1 Mg/kg iv bolus GHRP-2+GHRH, the subject's decreased GH secretion would be considered to be pathological possibly due to a deficiency of the hypothalamic GHRP-like hormone. 3. Relatively high GH response to 1 Mg/kg GHRP-2. 7. Low-dose GHRP-2 has such a unique effect on the GHRH pituitary action that the pathological decreased secretion of GH in some older men and women may result from a deficiency of the putative hypothalamic GHRP-like hormone. In conclusion, it is postulated that a putative GHRP-like system probably does exist and is involved in the physiological regulation of GH secretion. In addition, because of the unique actions of GHRP on GH release, it is likely to be valuable clinically both diagnostically and therapeutically.